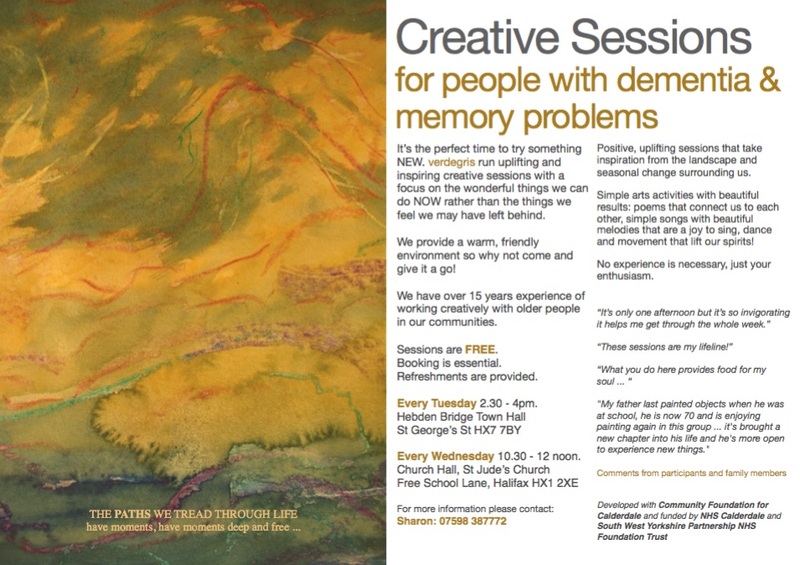 … every Tuesday at Hebden Bridge Town Hall verd de gris run meaningful and uplifting creative sessions for people living with dementia and their carers. These creative sessions focus on the wonderful things we can do NOW rather than the things we feel we may have left behind. We provide a warm, friendly environment with over 15 years experience of working creatively with older people in our communities. The sessions are FREE. Booking is essential. Refreshments are provided. Every Tuesday 2.30 – 4pm. Our Changing Landscapes approach is about changing our own ‘interior landscape’ … trying something new, bringing out something beautiful and essential. It’s about finding ways to share the beauty of the remembered landscape … the land itself, but also of home, of relationships, of loves and things lost. It’s also about changing the ‘landscape’ of the care home / day centre, filling it with warmth, fun, spirit. We do this by structuring the sessions around a particular theme e.g. Springtime, Sunshine, Dance, Time … this allows us to bring to the session lots of different creative activities, emotions and stimuli e.g. poetry, dance and movement, song and painting etc. The success of the sessions / positive outcomes relies on the fact that everyone has something special to contribute – everyone will have a response to the theme and so develop a creative response through the activities on offer … poems about Summertime, combined with a song such as ‘Summer Holiday’ and a colour-wash painting using bright yellows, oranges etc. always produces multi-layered, deep and rich. As well as getting people to express themselves and immerse themselves in the joy of the activity, our aim is to get people to connect: connecting with the poem or song, but also connecting with each other .. to share feelings, stories, passions or memories. We also strive to show care staff and family members just how vital and alive people are even within their dementia, that they can, in a sense, leave their dementia at the door and do something wonderful and life-affirming. We run a range of workshop activities for small groups and larger numbers of delegates at conferences and seminars. These sessions are made possible thanks to the generous support of South West Yorkshire Partnership NHS Foundation Trust through their Creative Minds scheme, Hebden Bridge Town Council, Hebden Bridge Rotary Club, the Bearder Charity and Fircroft Engineering.